Although you probably initially started using Front to manage team inboxes more effectively (like info@company.com), you may find it convenient to add your individual inbox (like firstname@company.com) to Front. That way, you can check all of your email in one place and work in Front full time. Individual inboxes are private by default, but you can share emails with your teammates to work together faster. Open Settings by clicking on your profile image in the upper left corner of Front. Click My inboxes, then Add an individual inbox. Select your individual inbox type from the list. Most users add their work email address (like joe@company.com), but you could choose any type you need. Fill in the account you want to connect and name the inbox. For example, you could call it "Work email". Click Next. Decide if anyone else should have access to your individual inbox. It's private by default, so only have access unless you check the box next to one of your teammates in this list. Click Create inbox. If your work email is a G Suite (Google Apps) domain, your last 10k emails will be imported into Front automatically. By default, emails arriving in your individual inbox will stay private unless you choose to share them with another team member. 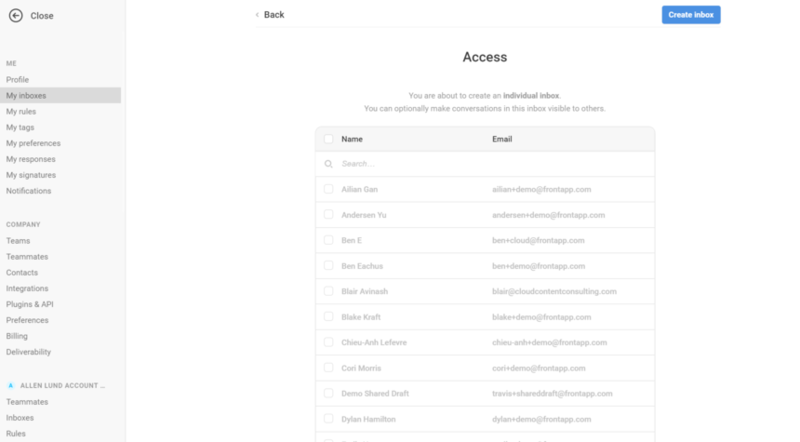 You can also share your entire individual inbox with a team member, if you like. Grant them access in your individual inbox settings under Teammates. I've shared an email with my teammate from my individual inbox, synced with the Gmail account. But when she tries to answer it, she gets an error that she can't compose from any channel. How can I grant an access to reply to such shared emails on my behalf? Svetlana Malakhova Hi! Can you send us the Conversation ID for the message she's trying to reply to? Please send it to team@frontapp.com and we'll take a look. Thanks! Hi Cori Morris . 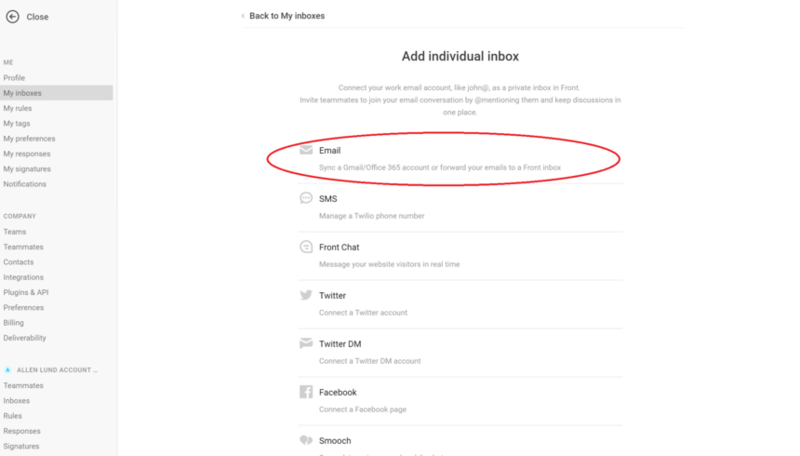 If I share an individual email, is there a way to cancel the share? Ben Hi there, yes, you can. If you click the 3 dots at the top, and select Share, you can check/uncheck the teammate you're sharing the conversation with.